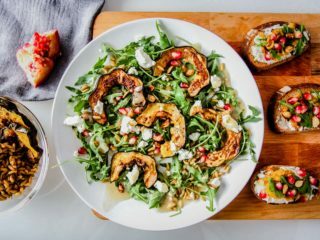 Winter Squash Salad with Pomegranates, Goat Cheese & Kamut, a fresh winter salad with arugula and winter vegetables and fruit that’s perfect on toast. Who said winter produce was boring? Late winter. That dreaded time between the new year and spring that seems to drag on for eternity. I have to admit this time period isn’t as bad now that I live in California, but growing up in the Midwestern United States and riding the weather rollercoaster of 3 days of 60 degree weather followed by a week of record-breaking snowfall was enough for me to pack my bags and head west. It was always a time of year I booked a trip somewhere warm, somewhere with sunshine and somewhere with fresh damn produce. Winter gets a bad rap for more than just the cold. The scarcity of fresh, seasonal vegetables starts to weigh on us. We’re tired of root vegetables, ok! This time of year is when kitchen creativity is at its finest. Your CSA box has a turnip, a stalk of celery, a carrot and maybe some dried lentils? Sounds like you’re having soup. A winter squash, a pomegranate and some weird ancient grain? Make a winter produce salad or that sh*t on toast! 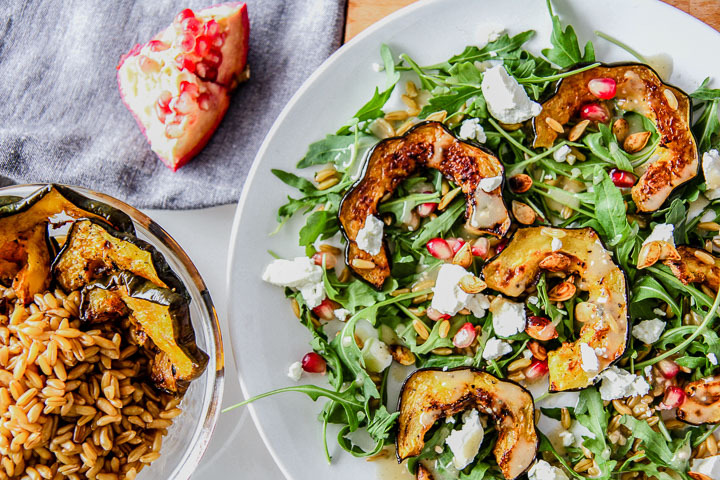 This Winter Squash Salad with Pomegranates, Goat Cheese & Kamut may be simple to make, but is anything but simple in flavor. I love the chewy texture of an ancient grain like kamut and the bitter crunch of arugula with winter squash. Top with sprinkled pomegranate seeds and goat cheese and it’s a fresh take on cold weather produce. But because winter is a time to be cozy, I automatically crave comfort food and a fresh salad is not always my first choice on a cold weather day. Don’t worry, this salad can sub as a delicious toast topper for when you want fresh vegetables but also are crazy a heartier meal. Winter salad two ways! Kamut, or khorasan wheat, is an ancient grain sometimes referred to as “pharaoh’s wheat” as it has been found in ancient Egyptian pharaoh tombs. It’s a sturdy, somewhat crunchy wheat kernel with a mild, nutty flavor and its introduction United States’ agriculture has an interesting backstory. The ancient grain does more than lend a chewy mouthfeel, it is also high in protein, fiber and some B vitamins and minerals (source) and consumption may help improve cardiovascular health (source). Squash is the jack-of-all-trades of winter cooking. From soups to sides to salads, it’s a cold weather staple ingredient that most any meal can be built around. As much as summer fruit gets all the love, we really cherish winter fruits because they are so rare. Think about the first time you see the season’s array of winter citrus, or the first round of pomegranates; pure joy, right? Winter bears us a delicious harvest, it just take some creativity to keep things exciting as we count down the days until spring. Winter Squash Salad with Pomegranates, Goat Cheese & Kamut, a fresh winter salad with arugula and winter vegetables and fruit that’s also perfect on toast. Who said winter produce was boring? Slice squash in half and then into thin 1/2 inch slices. Toss squash slices in olive oil and sprinkle with salt and pepper. Bake 25-30 minutes or until golden brown, flipping halfway through. To make salad: This isn’t rocket science, it’s a salad. 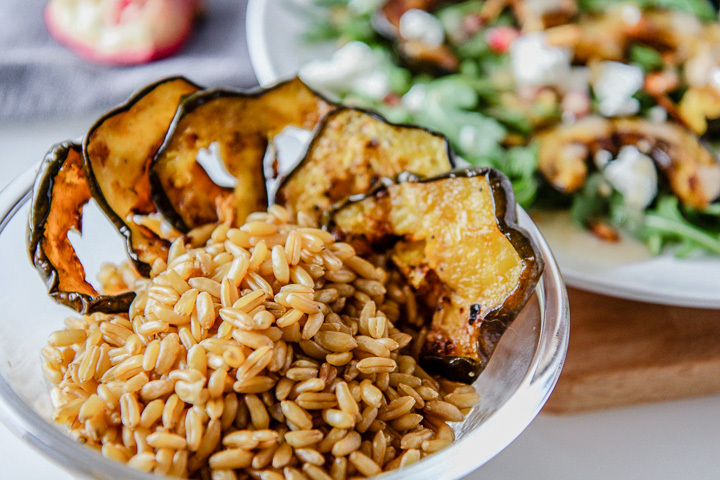 Toss the baked squash with the arugula, pomegranate seeds, kamut and dressing until your heart’s desire. Top with goat cheese. Demolish. To make toast: Again, it’s not molecular gastronomy. Smear (hate that word) the goat cheese on each slice of toast, mash the squash and spread over the cheese, then top with arugula and pomegranate seeds. Sprinkle with salt and pepper if needed, and have at it. Optional (but really good): Wash, dry and toss the squash seeds in olive oil, salt and pepper and then bake for 10 minutes. Sprinkle on the salad or toast to be extra fancy. Leftovers & Storage: This Winter Squash Salad can be premade and enjoyed for 4-5 days after, or until the produce starts to wilt and brown. 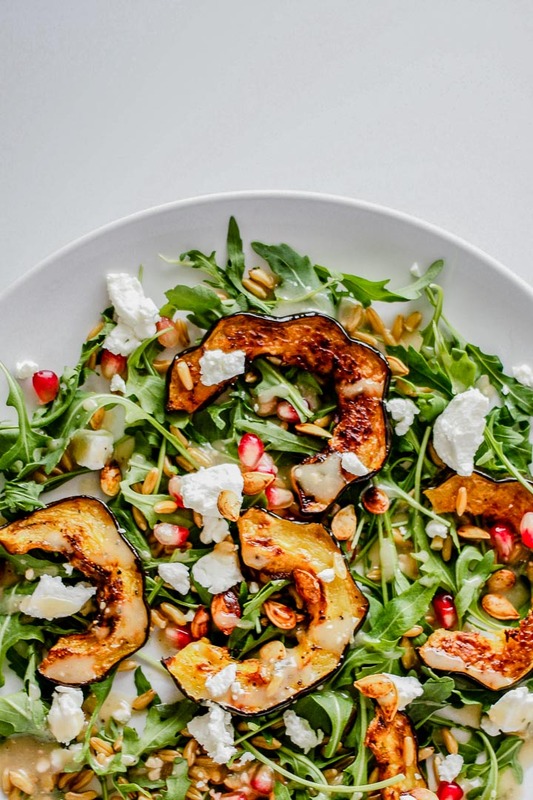 loving this winter squash salad? Try another of my favorite recipes featuring winter produce, like these Honey-Glazed Veggies with Carrot Top Pesto, Pasta with Clams in White Wine Garlic Sauce, and this cozy Peppermint Mocha Matcha Latte. Winter meals don’t have to be boring! What is your cold weather go-to recipe? I’d love to see your favorite winter produce recipes, leave me a comment below!